Dussehra which is often referred to as ‘Vijayadashami’ falls each year by the end of Navrathri. It is commemorated during the tenth day as per the Hindu calendar month ‘Ashvin’. Vijayadashami is celebrated across the Indian sub-continent for wide varieties of reasons. It denotes the end of Durga Pooja where Goddess Durga succeeded in annihilating the demon Mahishasura to procure dharma. During this auspicious day, live processions are held where effigies of Durga, Lakshmi and Saraswathi are transferred to a river followed by music and prayers. Later the idols are allowed to immerse deep into the water to bid goodbye. Massive effigies of Ravana are also burnt marking the total destruction of evil forces. 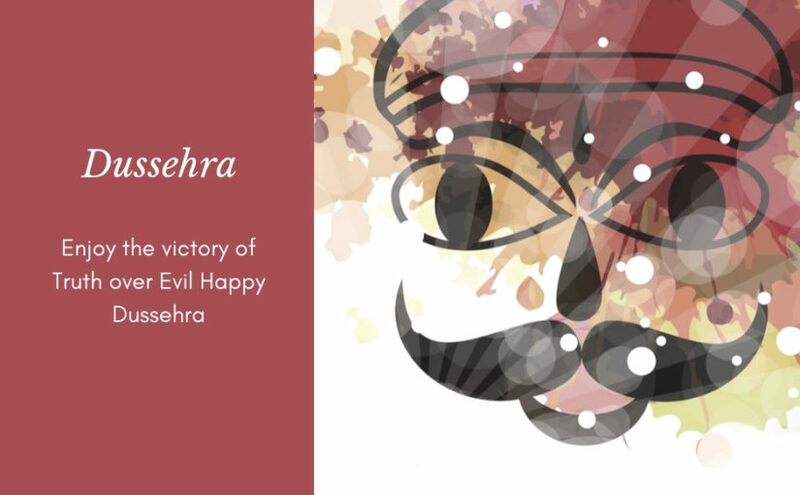 Dussehra is an annual Hindu festival which commemorates the victory of good over evil. According to the Hindu calendar, it is declared as a public holiday all over India. Most of the devotees of the Hindu community celebrate Dussehra by chanting prayers and serving food to the God almighty at homes and temples. Elsewhere, parades and outdoor fairs are organized where effigies of demon Ravana is burnt via bonfires marking the evil’s destruction. Dussehra is considered to be the pinnacle of the Navrathri festival. In some parts of Northern India, the celebrations may extend to a period of about ten days. Some of the live events performed during The Dussehra festival are discussed below. Organizing Ramlila which is regarded as the shortest version of famous epic Ramayana. Parades and processions are conducted where idols of Goddess Chamundeshwari is transferred to the town of Mysore in the Indian state of Karnataka. There is a common belief amongst the Hindus that it is lucky to foray into a new industry or commence a project during this auspicious occasion. Special Bengali cuisines such as luchi (deep fried flat bread) and alur dum (deep fried spiced potato snacks) are prepared. The entire property and work-related tools such as desktop PC’s, books, frying pans and vehicles are blessed. The people mutually exchange leaves plucked from the shami trees. What are the various types of symbols spotted during the celebration of Dussehra festival? During this auspicious occasion, most of the government offices and corporate firms are shut down. People celebrate this festival with optimum fun, zest and enthusiasm.